Forum Link : Discuss here ! Buy The BOG Book Subscribe To The BOG! Latest Money Savers! 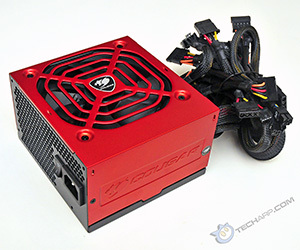 COUGAR was established in 2007 by a group of PC hardware enthusiasts in Germany, who wanted more than the typical PC cases and PSUs that had the same boring looks for umpteen years and internal layouts with endlessly uncreative cosmetic variations and poor quality. So COUGAR was formed to provide gamers more stylish product concepts with the strictest quality requirements. Today, COUGAR is a global brand manufacturer that focuses on high-quality PC cases and PSUs. Let's find out how well this PSU performs! For more details, read our Comprehensive Review! To discuss about this review, head over to the forum thread! Tech ARP is committed to developing new ways to improve your experience with us. As part of our continuous efforts to improve the value of our reviews to you, we are implementing a multi-tier review system. This review system is designed to allow you to quickly receive information on the latest hardware or software. This new system also allows you to quickly get the gist of the review without reading through it. This can be very useful, especially in situations where you need to make a quick purchase decision. In this new system, we start with a Product Overview whenever a company sends us a press release about their latest product. We shift through extraneous PR-talk to create a straightforward summary of the product's features as well as specifications. This allows you to quickly find out all the pertinent details about the product, without reading through official press releases. When we receive the product for review, we will quickly take photos of it and create a Pictorial Review. The purpose of a pictorial review is to allow you, the reader, to quickly examine the product visually. It may help you make better purchase decisions, especially if you cannot wait for the full review. After thorough testing, we will post a Comprehensive Review of the product. This adds on to the pictorial review with comprehensive test results and our final conclusion on the product. But no matter whether you are reading a Pictorial Review or a Comprehensive Review, you can always read the summary of the review as well as examine the product's specifications right on the first page. In all our new reviews, we will maintain the first page as a Product Overview page. If the product is listed in PriceGrabber, you can also check out the lowest price online. We hope this new review system will make your experience a lot more enjoyable and informative! If you like our work, you can help support out work by visiting our sponsors, participate in the Tech ARP Forums, or even donate to our fund. Any help you can render is greatly appreciated! Copyright © Tech ARP.com. All rights reserved.